A Vancouver Observer investigation has prompted hearings about whether the RCMP and CSIS broke the law by spying on environmental groups. The Security Intelligence Review Committee (SIRC) began hearing arguments today in Vancouver by the British Columbia Civil Liberties Association (BCCLA) regarding the Harper government's extensive spying on groups critical of the tar sands. The spying was revealed in documents obtained by National Observer's sister publication, Vancouver Observer, in 2013. "We wouldn’t be here if it hadn’t been for the Vancouver Observer," said BCCLA executive director Josh Paterson. The federal government has been vigorously spying on anti-oil sands activists and organizations in BC and across Canada since last December, documents obtained under the Access to Information Act show. Not only is the federal government subsidizing the energy industry in underwriting their costs, but deploying public-safety resources as a de facto "insurance policy" to ensure that federal strategies on proposed pipeline projects are achieved, these documents indicate. The federal government spying and monitoring of pipeline critics was illegal and had a "chilling" effect on Canadians' freedom of expression and freedom of association, BCCLA will argue, Paterson said. The hearings opened in a cloak of secrecy. The government barred reporters from photographing people going in or out of the court to prevent them from capturing the image of a secret agent. No media were allowed to observe or report on the hearings and the public is not allowed to attend. But Paterson spoke this morning about what he expected to happen behind closed doors. "Clearly, if there were issues of national security at stake — if there were information that would compromise the safety of agents in the field — you could see why a hearing might take place in secret," he said. "What we know from government documents makes clear that there was no threat to national security, that these groups were operating peacefully. So we don’t understand why at the very least CSIS can’t make more documents public about its activities," he added. "We’re arguing that CSIS broke the law by gathering intelligence about the democratic activities of Canadians in relation to the Enbridge Northern Gateway pipeline. We'll see through these hearings that spies and police though surveillance intimidate people until they feel like they don’t want to participate in the democratic process." In November 2013, Matt Millar, then a reporter for Vancouver Observer, obtained Freedom of Information (FOI) documents that showed the NEB coordinating with RCMP and CSIS to monitor several groups, including Idle No More, ForestEthics, Sierra Club, Leadnow, Dogwood Initiative and the Council of Canadians. The FOI material revealed that the NEB was arranging police protection for Enbridge and TransCanada staff, while keeping a close eye on their critics. Vancouver Observer subsequently reported that Canada's chief spy watchdog, Chuck Strahl, then head of SIRC, had registered as a lobbyist for Enbridge. Further investigations revealed that Strahl, a former Conservative cabinet minister, had been contracted by Enbridge since 2011. The stories prompted the BCCLA to file a complaint against RCMP and CSIS for 'illegal' monitoring of peaceful activists, Paterson said. They also led to Strahl's resignation due to perceived conflict of interest. "This stems from documents that were released to the Vancouver Observer that suggested that the RCMP and CSIS had gathered intelligence and shared intelligence on citizens group," said Paterson. "These were groups that were either assisting people to participate in the process, or organizing people to protest against the proposed pipeline. That is part of the life of a democracy and that should be welcomed." "Instead, we see that the government spied on these people and shared information about the activities of environmental groups with petroleum companies. This is highly problematic, and potentially a violation of people’s charter rights," Paterson said. Screenshot of email in which Rick Garber, NEB's "Group Leader of Security," discusses monitoring of First Nations pipeline critics in Prince Rupert. CSIS has disclosed very little information heading into the three-day hearings, BCCLA lawyer Paul Champ told the Canadian Press. Paterson said he hopes for a fair ruling by SIRC, but is disturbed by aspects of secrecy that might thwart a just process. "There’s a whole extra-secret part of the hearings that we’re not allowed to attend. Just CSIS and their lawyers will be there, and they’ll make their case in secret. They won’t even tell us when it’s going to happen. 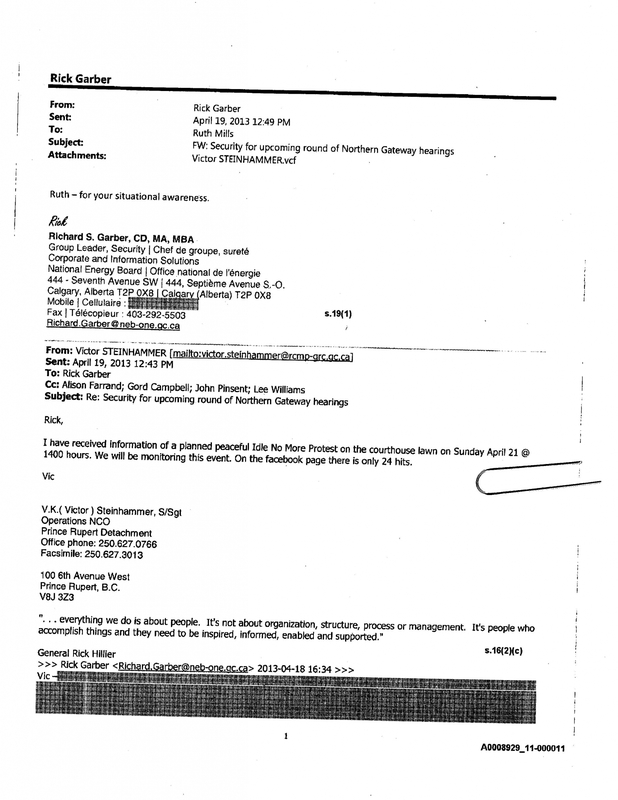 We’ll receive a redacted transcript." Yves Fortier, a member of the Security Intelligence Review Committee who was revealed to be a former TransCanada board member who still held shares in the company, will be part of the committee reviewing this case, he said. "[Fortier] himself is by all accounts an upstanding individual of impeccable reputation," Paterson said. "However, he did used to be on a board of a pipeline company whose name is mentioned in these documents. We had asked for him to step aside based on the appearance of bias." In November of 2013, Vancouver Observer broke the news that Harper government officials and spies met with industry officials in Ottawa. In February 2014 the BCCLA filed a complaint with the review committee after media reports suggested that CSIS and other government agencies considered opposition to the petroleum industry a threat to national security. The complaint cited reports the spy service had shared information with the National Energy Board about "radicalized environmentalist" groups seeking to participate in the board’s hearings on Enbridge’s Northern Gateway project, which would see Alberta crude flow westward to the B.C. coast. The passage of government security legislation that gives CSIS new powers to disrupt extremist activity has only heightened concerns about government monitoring of environmental and aboriginal protesters who oppose oil pipelines. Paterson is adamant that Bill C-51 has given CSIS far greater powers to break the law and even to violate the constitution. "They have to get a warrant from a judge but that gives us no comfort at all. It’s not the job of judges to break the law but to protect the constitution," he said. "This motivates CSIS to go to judges and say, 'Here’s what we’re planning,' but CSIS has a long history of breaching its duty of candor." "The only thing they’re not allowed to do is violate someone’s sexual integrity, to kill someone or to subvert justice," Paterson adderd. "Short of that, they’re being given the power to break the law and violate the constitution." CSIS did not immediately respond to questions about the process. SIRC has been reached for comment, but did not respond before publication time.